Welcome to the Chrysalis Online Dream School! This online dream course explores approaches to Active Dreaming in connection with the 4 Elements over 4 weeks. Active dreaming was pioneered by Robert Moss, a unique synthesis of modern dream work and ancient shamanic dream practices. ​This forum is created, moderated and facilitated by certified Active Dream Teacher, Valley Reed. In this 4 week course, we explore the 4 Elements of Dreaming, Earth, Air, Fire, Water. 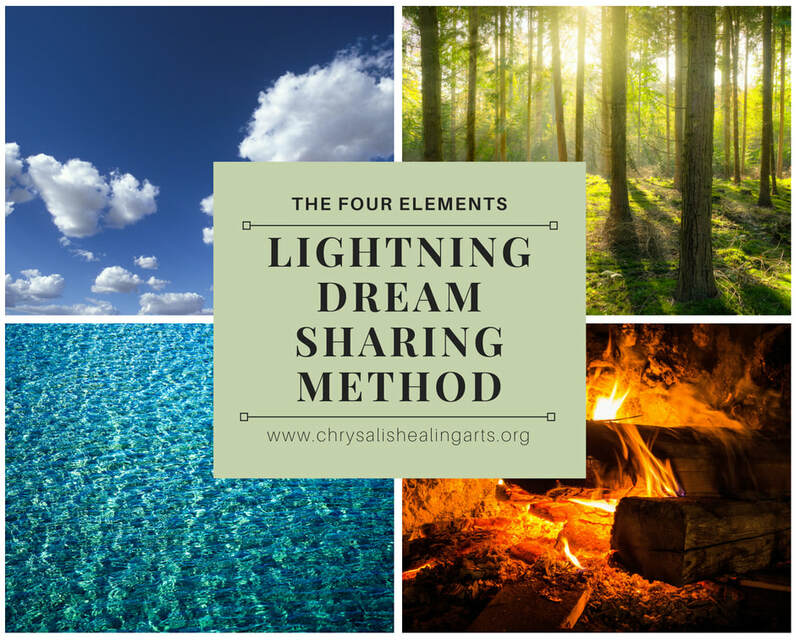 We practice the Lightning Method of Dream Sharing together and the core practices of Active Dreaming. Earth - The Tree of Life as Portal into the World Behind the World. We explore the body as a container of dreams and dream recall. We connect with the animal powers of the Earth and the bones of our ancestors. Air - Here we explore liminal spaces such as the hypnagogic zone and hypnapompic zone. We will work with the voice and the breath as powerful mediums for calling in what we want with our intentions, while setting strong boundaries for self and home. We explore breathing as a practice of release, to prepare us for going deeper into surrendering to the wisdom of the deeper self. We explore the practice of breathing in, through inspiration and allowing dreams to inspire and inform our life. We explore conscious dream flight and the ways we choose to travel in dreams. Water - The dream stream of consciousness, the ocean of soul, the depth of emotion, these are very dreamy places and spaces we can explore. We will travel in dreams into realms of deep contemplation, and streaming consciousness taking us into time travel. Fire - Action, transformation, creative spark, our fire calls us to action and dreams can bring through something completely new into the world, or transform us from our everyday limited mind to open us to paths of incredible transformation. Circle round the fires of your ancestors and delve deeply into paths set in motion before you were born. Please click the button below, to subscribe! The course link will be be emailed to you.